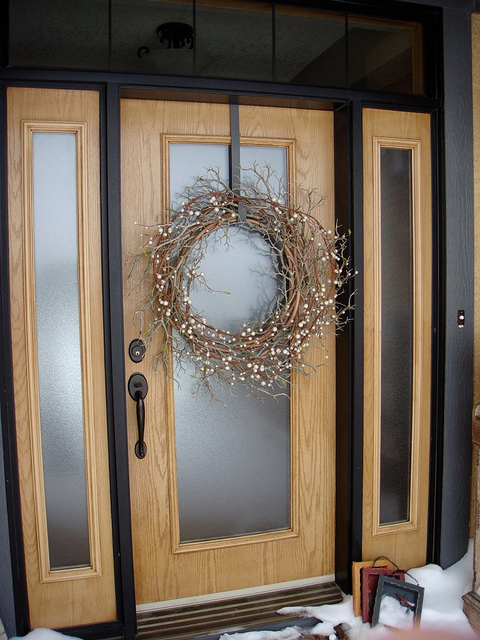 Whatever your personal tastes and budget, there are a multitude of ways to decorate your door or porch this Easter - no experience required. Outdoor wreath decorating can be made even more eye-catching by arranging your elements in a certain shape, or according to the current season or holiday. Heart shapes work especially well for Valentine's Day decor, and are easy to do. 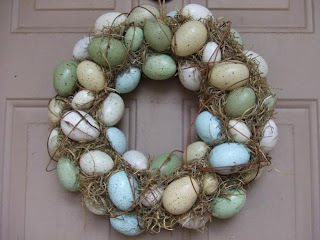 Whereas Easter wreaths are just begging to have Easter eggs incorporated into the design. It is also a great approach to use if you only have one or two materials that you want to use, as it keeps it simple but effective. For other holidays, try appropriate shapes for wreaths such as: star, triangular, oval, bell, rectangular, or even in the shape of letters. For Easter wreaths, spelling out the word "EGGS", or "SPRING" would be a good choice that wouldn't take up too much door decorating space. Polystyrene or lightweight wooden letters are easily available through craft stores, making the job much easier. 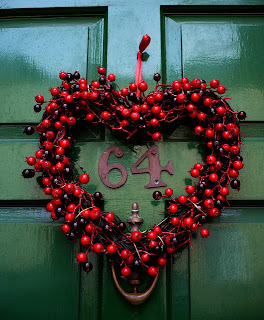 You can hang the wreath letters together, by threading ribbon through each one to join them, or attach and arrange them separately using outdoor wreath hooks on suckers. 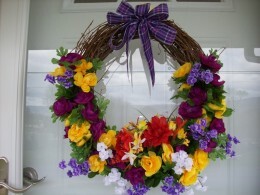 Wreath decorating ideas at Easter don't have to fresh bright colors. The advantage of decorating outdoor wreaths with already dried elements is that it will last for a long period of time - sometimes years. Using this approach means you also have more artistic freedom with regards to shape and arrangement. Decorating with branches and twigs, twisted round each other and bent into shape gives a good starting point. Secure the shape by winding wire around the main body of the wreath, and then add twigs, and bird ornaments to create a nest type Easter wreath design. More color can be added by incorporating spring elements like blossom, or even add some small eggs. Hang your decorated wreath by either some raffia or corn husks, or dress it up with ribbon. For a decorative wreath that will last for years and will withstand the outdoor elements, using faux flowers and foliage is a practical choice, especially for Easter wreaths when many flowers aren't yet in bloom. You can either weave your chosen elements into a shop bought twine, polystyrene, or dry oasis wreath frame, or use florists wire to start your design from scratch. As well as using faux flowers and leaves in their raw state, another wreath decorating idea you can use, it to add beads and ribbons to coordinate with the Spring and Easter theme. Polka dot ribbon works well, as do gingham designs. 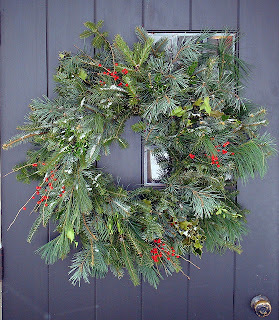 The classic image of outdoor wreath decorating incorporates the idea of using pine tree branches, pine cones, and berries - natural materials that are widely available. 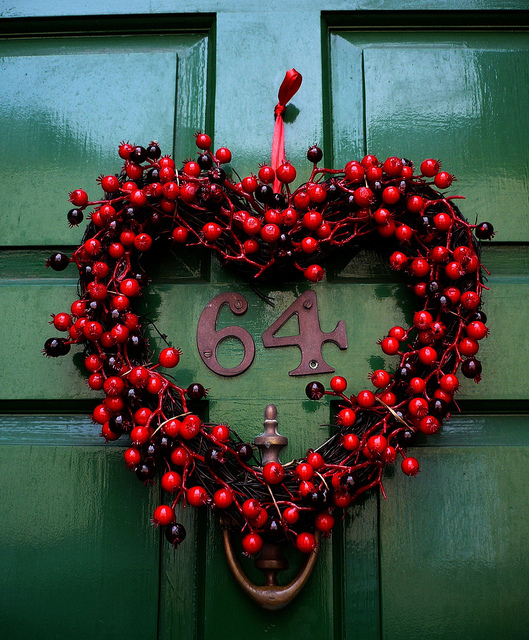 The downside of this approach is that your wreath will only last a short time. However, by using natural elements (avoiding anything that will decay quickly), although they will dry out, the decorated appearance will still be pleasing and natural. You can make your outdoor wreath last longer by using wet oasis (available from florists), that will feed a certain amount of moisture to your foliage. You can buy oasis in a classic ring shape, so all you need to do is push your elements into it, and you are done - be sure to use florists wire to secure the heavier items. 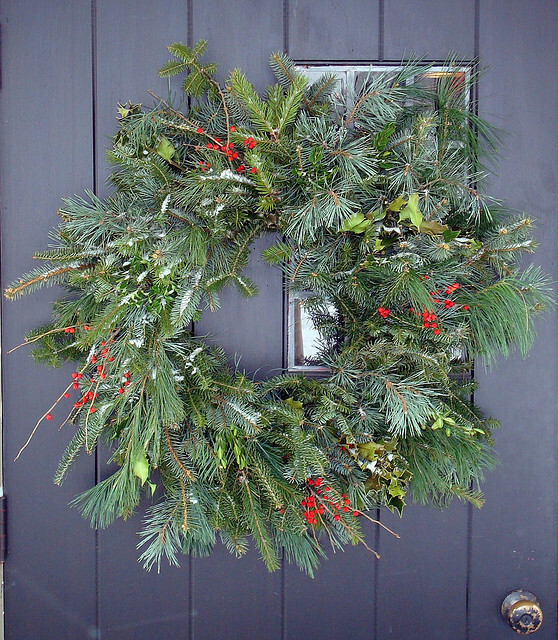 To truly stand out from the crowd, you might want to try something different in decorating outdoor wreaths this year. This is so easy to do - in fact it is easier than most of the traditional approaches detailed above. A quick way to create instant "wow" factor, is by starting with feathers and sticking them to a polystyrene ring using PVA/white glue. Marabou feathers are easy to obtain in lengths, just as you would buy ribbon from the haberdashery - white marabou feathers are a good choice for a Christmas wreath, or yellow and purple for Easter and Spring wreaths. 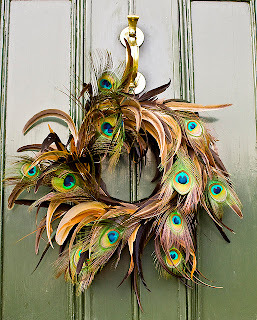 Or simply string some feathers together on floristry wire, and bend into a suitable wreath shape (peacock feathers pictured). You can leave these creations as they are or add some faux diamonds and pearls, or create a wreath entirely from fake bling. The choice is yours when it comes to making your door stand out, with these unique outdoor wreath decorating ideas. If you don't want to display your Easter wreaths outdoors, then why not try using them as a centerpiece on the spring table for a to complete your Easter day table decor.